Born in 1874, Benjamin LeRoy Miller was a Profess of Geology at Lehigh University from 1907-1944, having earned his A.B. from the University of Kansas and his Ph.D. from Johns Hopkins University. Before coming to Lehigh he taught at Penn College, Bryn Mawr, and briefly at Princeton. 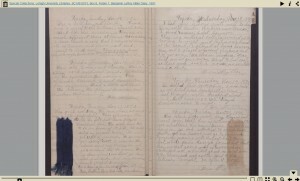 His diary, written when he was only 17, describes his life as a student in Kansas. It begins in Rock Creek, Kansas on January 1, 1891, and ends in Topeka, Kansas on December 31, 1891.